On Tuesday the 15th of October, a team consisting of Sven van Haelst from the Flanders Marine Institute VLIZ, Jessica Vandevelde from the Flanders Heritage Agency (Onroerend Erfgoed) and Robert de Hoop from the Dutch Maritime Heritage Agency did a survey on the wreck of the Dutch East India Company ship ‘t Vliegent Hart lying in Belgian waters. In February 1735 the Dutch East Indiaman ‘t Vliegent Hart wrecked shortly after leaving Zeeland for Batavia (Indonesia). The three-master, roughly 44 m long and 11 m wide and armed with 42 guns, was built in 1729-1730 in Middelburg and served as a transport vessel between the Netherlands and Asia. For its second voyage to Batavia in 1735 it carried a cargo of wood, building bricks, iron, gunpowder and wine, as well as several chests with gold and silver ducats. In the afternoon of February 3rd the vessel left the port of Rammekens near Vlissingen in convoy with a smaller ship, the Anna Catharina, and a pilot boat. A few hours after leaving the port in a northeasterly gale the Anna Catharina ran aground on one of the many sandbanks in the Deurlo channel and perished. ‘t Vliegent Hart struck the same sandbank but managed to break loose with the rising tide. The damaged vessel, largely adrift, finally reached the deeper water of the Schooneveld where it dropped anchor that night. Water poured into the broken hull and soon ‘t Vliegent Hart sank too, in 18 meters water depth. In total, over 400 men were lost. Soon after the wreckage a chart was compiled by Abraham Anias, showing the location of the two wrecks. Reason for the recent survey was that a multibeam from a couple of months ago showed that parts of the shipwreck were uncovered. 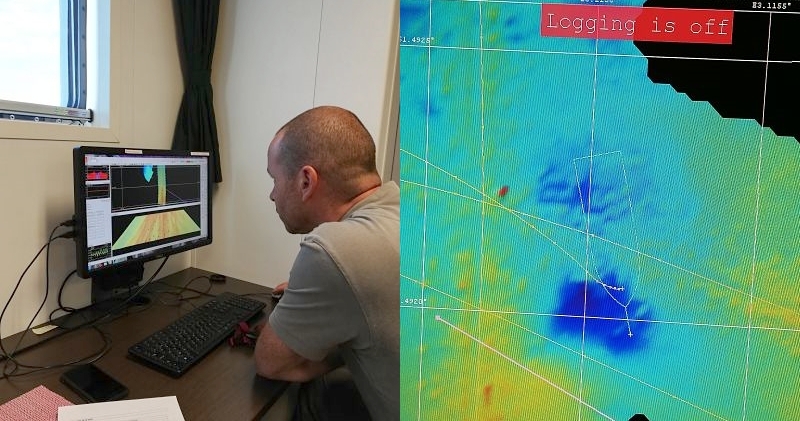 A new multibeam survey was done by the Flanders Marine Institute from RV Simon Stevin and after that a dive survey was done as well. Although the visibility underwater was zero, we did manage to confirm that parts of the shipwreck (shipwood, bricks and concretions containing metal objects) were uncovered and that the wood is being threatened as it is slowly eaten away by the Teredo Navalis, or the naval shipworm. One of the main goals of the Maritime Heritage program is to work together with countries to manage all Dutch shipwrecks of which the Netherlands claims ownership. Among them are the remains of the ships of the Dutch East India Company and the West Indian Companies, the admiralties and war vessels. A first step in a new collaboration between Belgium and the Netherlands was made with this survey. In the forthcoming months we will exchange knowledge about the management and in situ preservation techniques, and look together what measurements we can take to protect this shipwreck.